First, I need to mention that the credentials of all the presenters were awe-inspiring. From climbers of the highest mountains to writers whose words readily evoked visual and emotional sensations, every single one was amazing. It was interesting to see how many of them already knew each other – several were honorary (or regular) members of the Himalayan Club of India. The club was one of the co-sponsors of the festival. I’m including links to as many of the presenters’ websites as I can. The basic biographies of all are linked from the festival webpage. Wednesday the festival began with sessions especially for the elementary school students. 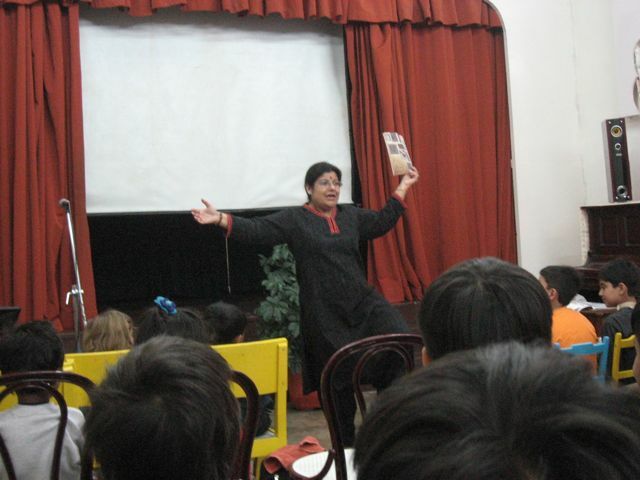 Paro Anand is a prolific writer for children and young adults. She is also an accomplished story teller. She works with children all over India and several European countries. She told the story from her book “Pabloo Bear’s Adventure,” a tale of how the Himalayan bear got its white throat patch when his mother found him injured and sewed him up with a moonbeam. Paro has visited Woodstock several times before. Prerna Bindra works with many publications writing on nature and wildlife. She told a story of tigers and had many beautiful slides of them. She has dedicated her life to saving endangered species, especially by writing about them. Following a tea break (of course, we’re in India! ), Toby Sinclair showed his film “Ganges,” the first of a trilogy made by the BBC. This one focused on the sources of the river in the mountains and had stunning footage of the area, including snow leopards and other wildlife. The second and third parts cover the plains and the delta. The film is available on Netflix and Amazon. He called the river “Daughter of the Mountains,” a beautiful image. One-tenth of all humankind live in the region of the Ganga (Indian name). The film was awe-inspiring, with its scenes of glaciers and flowing mountain streams. Up to the Hills - Book Festival cont'd.